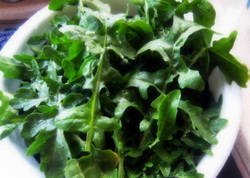 Another recipe to help the family get over its arugula-bias. This is from my friend Kat, who daily feeds 4 healthy growing boys/teenagers/men all the while maintaining her wit and sanity. She says wine helps. A lot. Teenage-boy metabolism is thing of beauty, so please note that while this is meatless and chock-full of red and green vegetables, it also uses a healthy dose of heavy cream. Feeding My Ohana doesn't shy away from butter, cream, Spam and the like, but everything in moderation. We also advocate old-lady jogging, yoga, or some other happy, healthy form of regular mind and body exercise. Best to get twisty ones that hold sauce well. Heat the olive oil in a medium saucepan over medium heat, add the garlic, and cook for a minute or so. Add heavy cream, zest from 2 lemons, and the juice of 2 lemons. Salt, and pepper to taste. Bring to a boil, then lower the heat and simmer for 15 to 20 minutes so it starts to thicken. Cook pasta in a big pot according to directions, until just al dente. Meanwhile, cut the broccoli in florets. Toss broccoli into the colander that you will be using to drain pasta. Pour the pasta (and boiling pasta water) over the broccoli into the colander to drain. Dump pasta and broccoli back into the big pot. Immediately add the garlic-lemon cream mixture. Cook over medium-low heat for a minute or so. Add the arugula and tomatoes. Pour the hot pasta into a large serving bowl. Toss well with Parmesan cheese. add Parmesan. Season to taste if necessary, serve hot, and make sure you get your share before the teenage boys dive in.